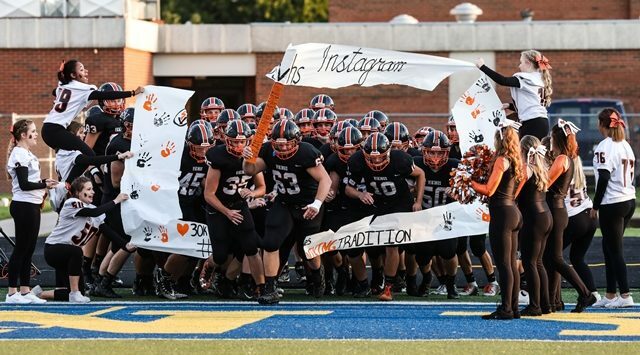 The Smoky Valley Vikings handled the Chapman Irish 30-22 on Friday night. The defense started the game off with a 3 and out, then quickly answered offensively on a 12 play 59 yard drive capped off by a Lane Schrag pass to Tim Lambert from 7 yards out with 4:10 remaining in the first quarter. PAT run by Lambert was also good making it 8-0. But Chapman, getting away from their ground game, completed a 50 yard pass from Jackson to Colton for the score. The two-point conversion failed making it 8-6, just before the end of the quarter. Midway through the second quarter the Vikings, facing a 4th down inside the 10 yard line, turned the ball over on downs. The defense again responded by forcing a fumble on a third down play recovered by Blake Heble. Cort Elliott then scored on a 5 yard plunge and the PAT pass to Heble made it 16-6. Then the defense shut down a Chapman drive just before half keeping them out of the end zone to maintain the 16-6 lead. An onside kick by Chapman started the 2nd half as they recovered at the kick followed by a Jackson run to put them in scoring position. Jackson then completes a 4th down pass to Colton in the end zone making the score 16-14 after the 2 point conversion. The Viking offense countered with a 10 play 80 yard drive culminating in a 16 yard Lambert run. Schrag 2 point PAT made the score 24-14. Early in the 4th quarter Lane Schrag broke free on a 66 yard scamper making the score 30-14. Following a late Viking fumble, Jackson found Colton in the corner of the end zone from 7 yards out. The 2 point PAT run was good making the final 30-22. On the night Smoky Valley had 51 plays for 360 yards compared to Chapman’s 52 plays for 221 yards, of which 108 were through the air. Tim Lambert had 24 carries for 156 yards on the ground and Lane Schrag had 8 carries for 130 yards for Smoky Valley. Up next for Smoky Valley is Halstead Friday at Anderson Field in Lindsborg.